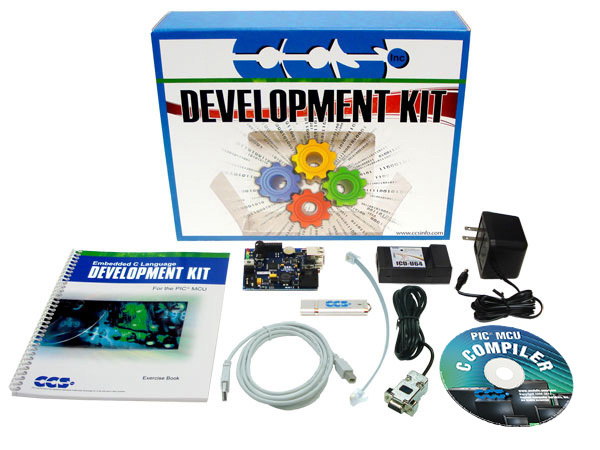 This kit enables users to begin USB Master development with Microchip's PIC® PIC18 family and FTDI's Vinculum™ VNC1L USB Host Controller. The development kit includes the powerful PCWH Integrated Development Environment with compiler support for Microchip's PIC® PIC10, PIC12, PIC16 and PIC18 families and an ICD-U64 in-circuit programmer/debugger that supports C-aware real time debugging. 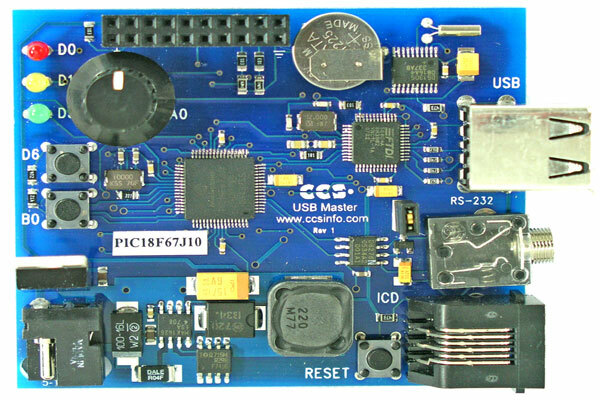 The USB Master Prototyping Board allows a developer to add USB master functionality to an embedded system without the need of detailed knowledge of USB protocol. The prototyping board hosts a Vinculum™ VNC1L chip that allows for a microcontroller to interface with USB devices as the master bus. The on-board PIC18F67J10 device communicates directly with the VNC1L chip through a series of commands. The user can communicate directly with the VNC1L chip through the RS232 port. DOS-like commands will control the VNC1L chip or USB peripheral devices. The board is loaded with a general purpose Vinculum™ VDAP (Vinculum™ Disks and Peripherals) firmware loaded. Exercises and examples include reading and writing to a BOMS (Bulk Only Mass Storage) device (A.K.A. USB Flash Stick), responding to keyboard strokes and interfacing with HID devices such as a printer. The VNC1L chip allows a microcontroller to interface to other USB devices as the bus master. The VNC1L quickly allows the user the ability to interact with firmware programs that may be loaded onto the chip. The VNC1L chip can interface with common HID devices like a mouse or keypad. The VNC1L can also read and write a bulk-only mass storage device such as a Flash drive, act as a limited USB hub, communicate with a printer and communicate with CDC-class devices. The USB Master Prototyping Board operates with Vinculum™ firmware. Vinculum™ offers several firmware options for the VNC1L chip and the user can select the firmware based on their application needs. In order to utilize other firmware loads available, a serial bootloader has been provided by CCS.